What role do galleries play in creating and maintaining a vibrant art scene and a strong art community? How do galleries benefit both collectors and artists? When you have a myriad of options for purchasing art—on line, auction houses and benefit art auctions, straight from an artist’s studio—why should you patronize galleries? The Russo Lee Gallery is proud to present a conversation around the function of an art gallery and the individuals who work within its sphere. This discussion will explore the difference between the experience of art in the traditional bricks and mortar operation and the ever-changing online reality. We will look at the building of history, of how galleries document and promote an area, an individual and a market. 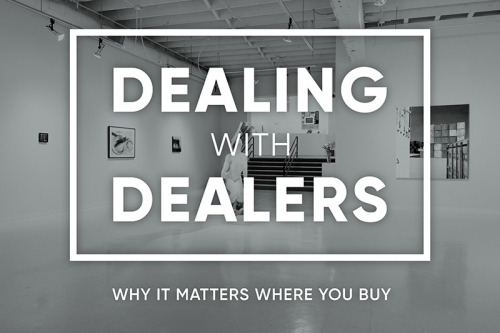 Dealing with Dealers is also a discussion about what representation gives to the artists, and what art galleries provide for the public at large – even for those who do not purchase art. Sarah Conley Odenkirk has practiced law in the area of fine art for more than 20 years. She is currently located in Los Angeles, California where, in addition to her administrative and academic roles at Claremont Graduate University, she consults with clients locally and nationally. Sarah advises clients in transactional matters related to the arts in the private and public realms. Linda Tesner has a long history of involvement in our region’s art community. In her current position as the Director of the Hoffman Gallery at Lewis & Clark College, she has curated numerous one-person exhibitions featuring Northwest artists. She has also held curatorial positions at the Portland Art Museum and the Maryhill Museum of Art and has served as an art consultant, advising both corporate and private clients in matters related to building and managing an art collection. This marks the fifth in a series of art conversations on interpreting, understanding and collecting presented by the members of the Portland Art Dealers Association.